While some of us wait patiently for a real-life version of the housekeeper from The Jetsons, today’s “working robots” are taking on a surprising variety of tasks, as evidenced by this collection of recent photos provided by Reuters. 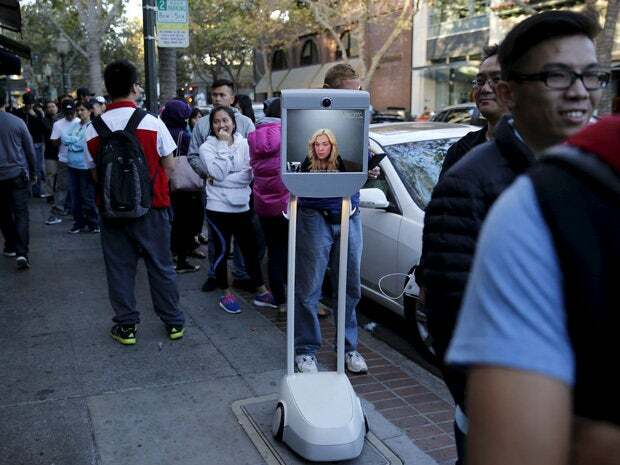 While it certainly must have rankled some in the line, Brianna Lempesis is seen on a video screen on her "Beam" robot while waiting to buy an iPhone 6S at an Apple store in Palo Alto. The San Diego woman made the purchase via the screen and the phone was attached to a hook on the robot. No word on how it got back to San Diego. 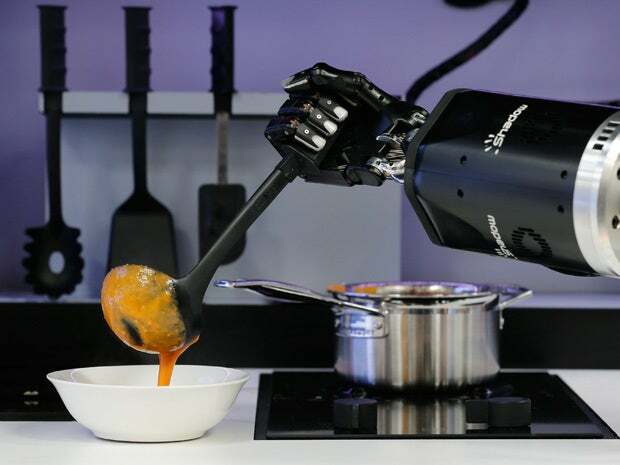 While the orange color seems less than appealing, a robot in the Robotic Kitchen prototype created by Moley Robotics cooks what is said to be a crab soup at the company's booth at a technology convention in Hanover, Germany. What’s in your kitchen? 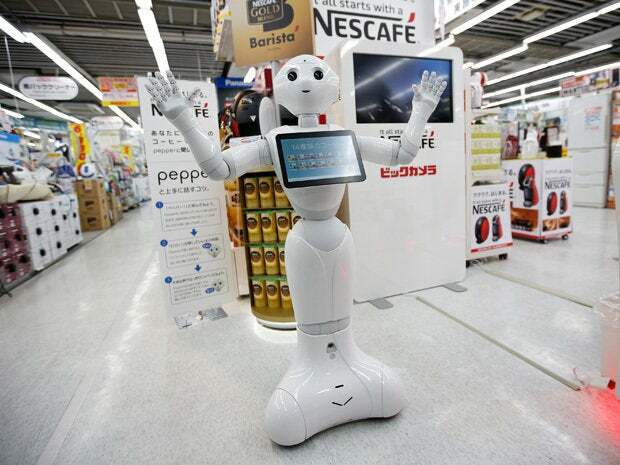 A robot named Pepper, created by SoftBank Corp., earns its keep by touting Nestle coffee machines at a store in Tokyo. 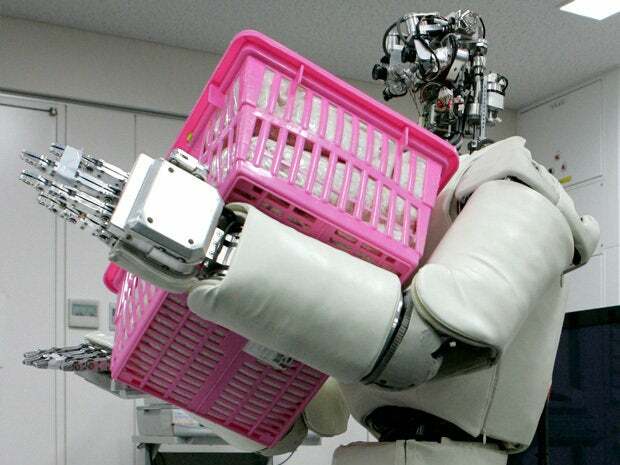 The laundry robot may not yet be available, but here we see a humanoid robot, jointly developed by University of Tokyo and a Japanese research organization, lift a basket filled with approximately 66 pounds of coral sand. It’s a start. Robot bartender “Carl” tends to customers in the eastern German town of Ilmenau. 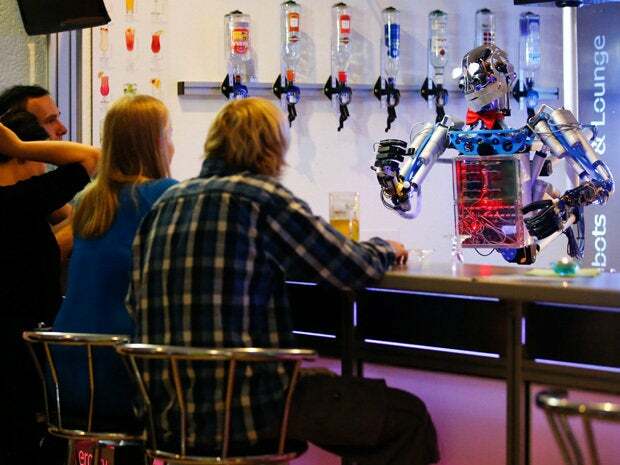 This barkeep was developed and built by mechatronics engineer Ben Schaefer, who runs a company for humanoid robots. The robot is said to be able to provide a limited menu of chit-chat, too. 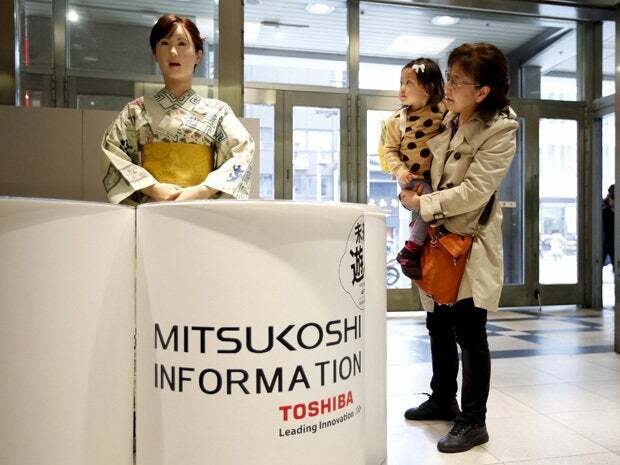 Never mind replacing the better jobs, this kimono-clad robot from Toshiba staffs the reception desk at a department store in Tokyo. 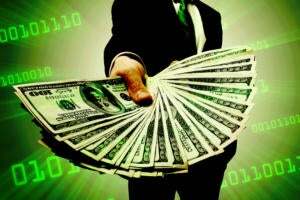 It can even use sign language. 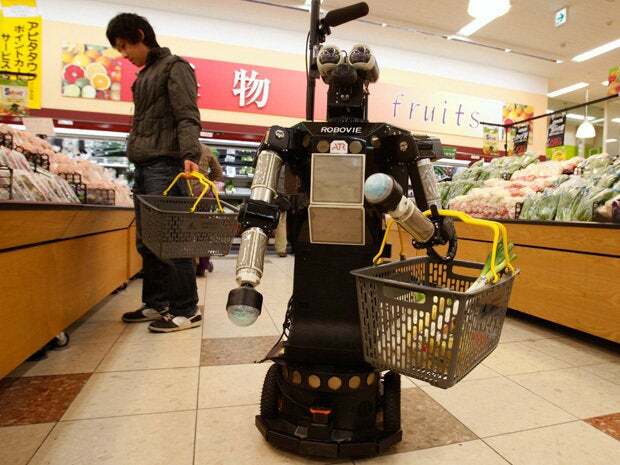 A robot dubbed "Robovie-II" navigates a grocery store in Kyoto as part of an experiment developed by Japanese robotics research institution ATR to help the elderly with chores such as shopping. 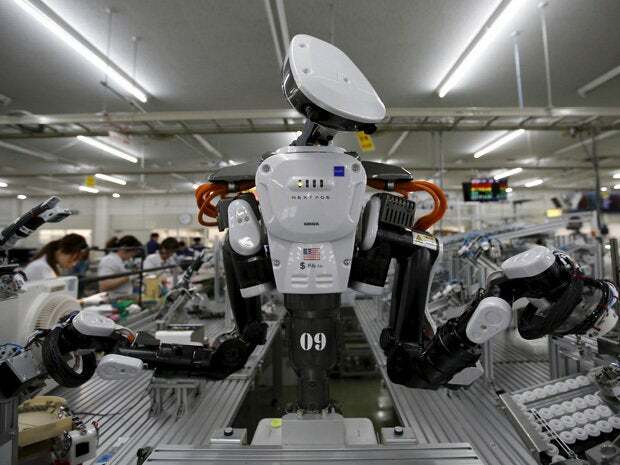 A humanoid robot works alongside employees (it will eventually displace) in the assembly line at a factory of Glory Ltd., a manufacturer of automatic change dispensers, in Kazo, north of Tokyo, Japan. A robot called Nadine looks at her laptop next to one of the computer systems running her software in Singapore. 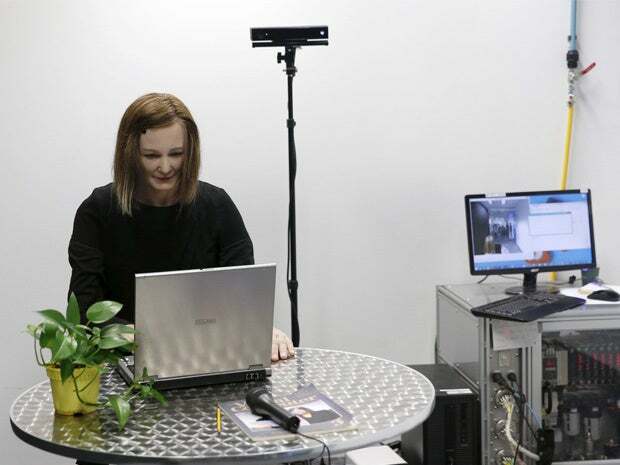 With her brown hair, soft skin and expressive face, Nadine is a new brand of human-like robot that could one day, scientists say, be used as a personal assistant or care provider for the elderly. 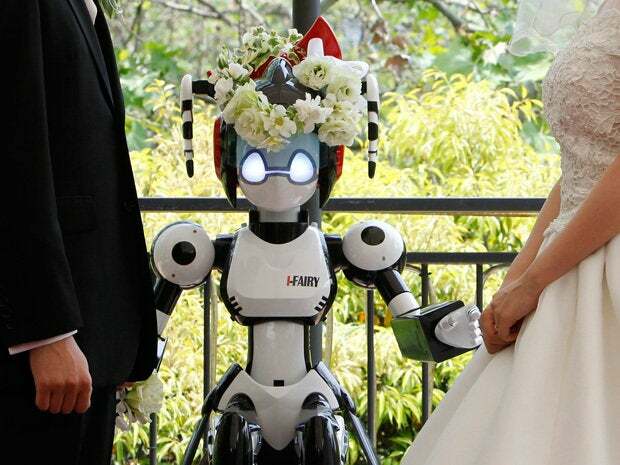 This one is from rather deep in Reuters archives, 2010, and shows a humanoid robot named "I-Fairy" acting as a witness at the wedding ceremony between Tomohiro Shibata, left, and Satoko Inoue in Tokyo. No word on whether the robot or marriage remain intact. A visitor speaks to Baidu's robot Xiaodu at the 2015 Baidu World Conference in Beijing. 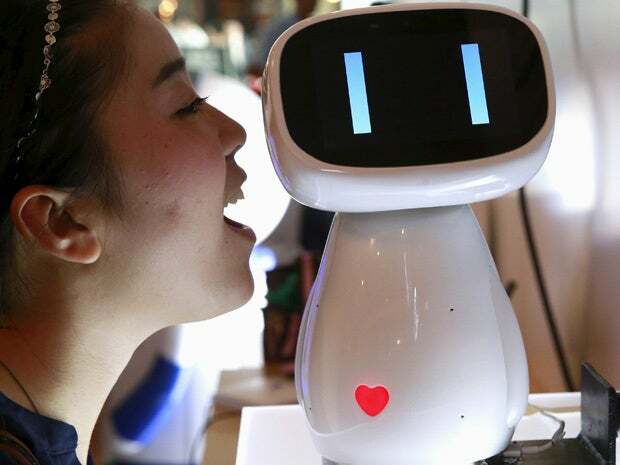 Xiaodu, an artificial intelligent robot developed by Baidu, has access to the company's search engine database and can respond to voice commands. 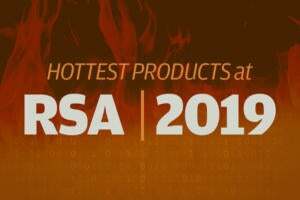 Now that the “booth babe” has become verboten at some trade shows and conferences, a robotic replacement may be near. 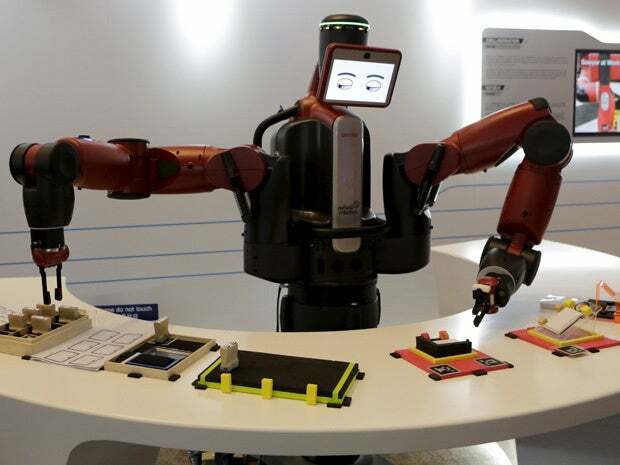 A Baxter robot of Rethink Robotics picks up a business card as it performs during a display at the World Economic Forum in China's port city of Dalian. 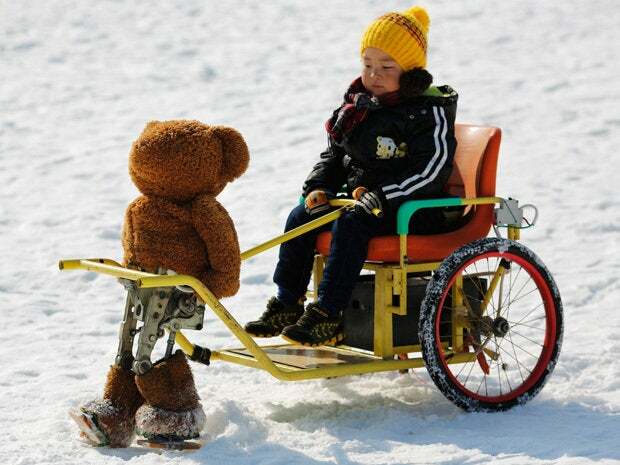 A boy gets a ride powered by a robot dressed as a Teddy bear during a carnival last year in Beijing.